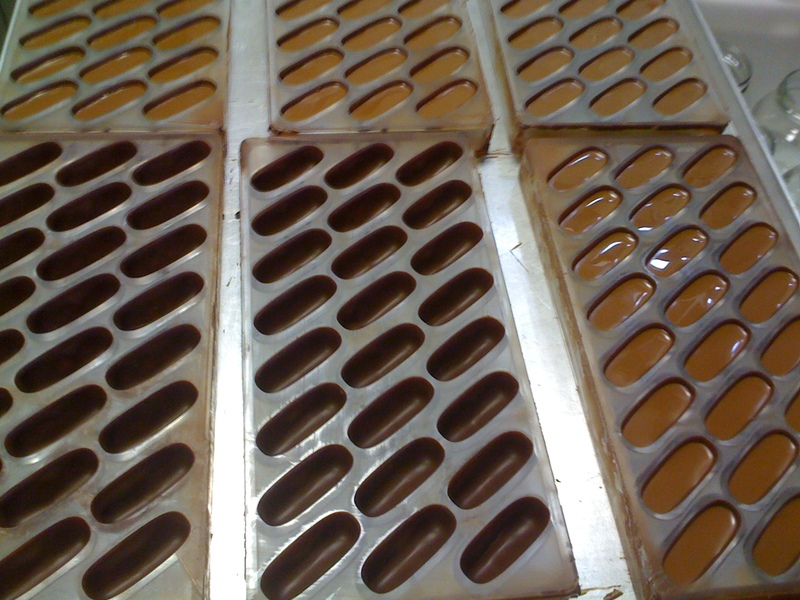 Making the gianduiotti/a chocolate product of Piedmont. My culinary adventure in Italy has been one part self-evolving and one part serendipitous. I moved to Turin, Italy in September last year to follow my heart and study Italian all within the hope of working in the culinary field. After studying Italian for six months, an idea came to mind to contact the good people of Gustiamo, an American-based company that imports Italian artisan products. To my surprise, it was made known to me that one of the proprietors of Gustiamo would soon be traveling to Turin. I was just about finished with my Italian language course work at L’Italiano Porticando and was looking to stage with an artisan producer. Beatrice, one of the owners of Gustiamo recommended Silvio Bessone, chocolate master in Santuario di Vicoforte. I absolutely adore the region of Piedmont and it is the home of Slow Food International. So, working with a producer in the region was the perfect match. One month is not nearly long enough to learn all about the production that goes on here. I learned the difference between cacao from cru (cacao that comes from one plantation) and mono origin (cacao that comes from one geographic origin that has many cru). Silvio toasts the cacao before it goes into production. Some cacao is naturally more perfumed than others and the aromas that filled the air during the roasting process were intoxicating. Some have notes of banana, plum or even the crust of fresh baked bread. I discovered that chocolate is similar to wine in that there are so many variations in taste. For example, one chocolate I tasted from Africa had notes of licorice and cinnamon while another type of chocolate from Java tended to have more of a slightly bitter (amaro) note. During my stage I helped in the production of gianduiotti (jian-dui-yoti) ripieni (filled with a luscious hazelnut butter). Gianduiotti are individually wrapped pieces of chocolate made with powdered sugar and hazelnuts (freshly roasted) from the Langha area in Piedmont; hence the name for this type of chocolate is in Piemontese, the dialect from Piedmont. The celebrated chocolate derives its name from a characteristic Piedmont mask known as a symbol of the struggle for independence from France in this region during the year 1799. In the year 1806 on a cause of the Napoleon blockade, Piedmont chocolate masters were not able to supply themselves with the necessary amount of cacao. 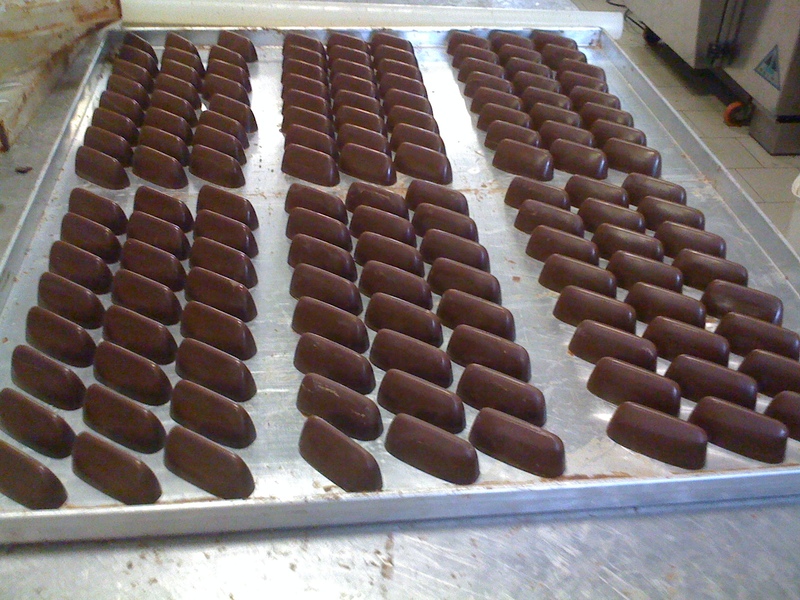 The chocolate masters had the idea to mix the cacao with local hazelnuts that were ground into a fine powder. This made the end product more economical and they were also able to cut down on the price of transporting it. Silvio has personal relationships with all of the organic farmers from who he buys the cacao and also insures a just and living wage for those who work the land. He and his wife make it a priority to visit some of the farms during the year. After the devastating tsunami that hit Sri Lanka for example, he traveled to the country to help re-establish the cacao farmers. Chocolate is a sustainable product for Silvio. He retains the organic matter after the cacao is shelled and this in turn is made into compost for the community. One can see the passion and dedication Silvio puts into all of his products and his family is always there to lend a hand when needed. Silvio Bessone is the epitome of the Slow Food movement. I feel honored to have had the opportunity to stage with him and I hope to work with him again in the near future. Congrats on the launch of the new blog. I’ve tasted that wonderful chocolate with hazelnut and it is delicious. Thanks Lorraine…and thanks to you for giving me the push to give it a go. WOW this sounds like a dream come true! I found your blog while looking up culinary schools in Italy. This is such a wonderful story and it sounds like such a unique experience. I hope to find an opportunity as beautiful as this one day! Thanks for writing Tiana! Keep pushing and you will find all that you seek. Every time we go back to Italy, to see family and friends in Torino, Rome and Modena we have one of our bags packed with lots of goodies that we can bring back home to the the US. Gianduiotti, Cri Cri and chocolate in general from Torino, Aceto Balsamico di Modena and Parmigiano Reggiano 30 months from Modena and from Rome the ancient flair (I would like to bring some Porchetta d-Ariccia or some Guanciale to make an authentic Bucatini all’amatriciana, but US customs don’t allow import of meat products….). All the best for your esperienza fantastica, in Torino and in Piemonte you are experiencing the best wines and gastronomia!! Thank you so very much and perhaps the next time you all are in Torino, we could get together. Sicuramente! Magari andremo a prendere un caffe da Baratti o a cena al Porto di Savona (su Piazza Vittorio, ci sei stata?). D’accordo! Porto di Savona, ci sono stata. Abitavo vicino a quella zona per due anni. Adesso, sono sposata e abitiamo a San Salvario…mio marito è torinese. Tanti anni fa abitavo nello stato de Texas, vicino a Dallas ma vengo da Miami. Saremo qui per un po’, sono incinta! Che bella notizia! I miei tre figli sono nati a Torino, e’ la loro citta’ e gli manca. Ma anche qui nel Maine stanno bene, in mezzo alla natura, i boschi e la neve (oggi e’ snowday!). Allora visto che oltre alla gastronomia e pasticceria, credo che ti interessi anche un blog di una mia amica di Torino, unamamma.it dove trovi tante informazioni e post carini. Giuliana Girino, la mia amica, ha anche scritto un libro “Il primo libro di una mamma” che puo’ farti compagnia (magari la conosci gia’ nel mondo dei mom blogger?). My spouse and I stumbled over here different web address and thought I might as well check things out. I like what I see so i am just following you. Look forward to finding out about your web page for a second time. Felt the need to thank you on this excellent post. I’ve already posted a link on my Twitter Account because I really like your attention to detail. Thanks again! I simply want to mention I am beginner to blogs and absolutely loved this page. Probably I’m going to bookmark your blog post . You definitely have incredible stories. Thank you for sharing with us your blog.